Alaska just took its brutal war against the polar bear to a new level. The state was already in court to strip federal protection from the polar bear, but last week it launched a new attack — on the bear’s habitat. It filed a legal notice to strike down the federal government’s designation of a 120-million-acre polar bear reserve along Alaska’s northern coast. This is the largest imperiled species habitat reserve in history — bigger than 48 of the 50 states — and protecting it is essential to the survival of the polar bear. The Center for Biological Diversity has just a few weeks to prepare to beat back Alaska’s new antiwildlife lawsuit, and we need to raise the funds now to do it. Please, help us save the polar bear and the largest habitat reserve in history: Donate today to our Endangered Species Action Fund. A Center donor will triple-match any gift made by Dec. 31, so your donation will be worth three times as much. Just four days to triple your gift and save polar bears. The Center has been leading the charge to save polar bears since 2005. We got the majestic white bears placed on the federal list of “threatened species,” we stopped oil drilling in their habitat and we won the 120-million-acre habitat reserve earlier this year. We’ve been fighting for years to stop Alaska’s bid to strip federal protection from the polar bear. And with your help today, we’ll be in court again in just two months to stop the state’s effort to eradicate the bears’ habitat reserve as well. Help us win the looming legal battle to save the polar bear’s habitat by making a generous emergency gift to our Endangered Species Action Fund by the end of the year. Now is the best time to do it, since a Center supporter will make your gift worth three times as much by triple-matching donations made by Dec. 31. The Center doesn’t spend its money mailing wolf and polar bear plush toys. We don’t offer calendars and tote bags. We spend our members’ donations protecting endangered species, period. And we win: Our 93 percent success rate in the courts is unparalleled in the environmental movement. So is our protection of more than 500 species and 230 million acres of wildlife reserves. Unfortunately, Alaska isn’t the only one attacking polar bears. Last week Interior Secretary Ken Salazar made two stunning decisions that could drive the polar bear extinct if we don’t stop him as well. In lock-step with Bush administration policies already struck down by the courts, first Salazar opened up huge areas of polar bear habitat to offshore oil drilling — despite the devastating spill impacts we saw in the Gulf of Mexico — and then he refused to upgrade the polar bear’s legal status from “threatened” to “endangered.” Withholding full protection from the polar bear gives Salazar an excuse for not stopping fossil fuel pollution from coal-fired power plants that are driving the species extinct. But with your generous support and our 20-plus years of winning life-saving results for endangered wildlife, the Center will take on Alaska and Salazar at the same time, saving the polar bear and its precious, disappearing habitat. P.S. Your generous gift truly makes a difference when you give to the Center and keep our expert staff on the front lines of the most critical battles for the survival of species — like the polar bear in Alaska. For only the next four days, a Center donor will match your gift, making it worth three times as much. Please give to our Endangered Species Action Fund by Dec. 31 and encourage your friends and family to join this life-saving, planet-saving effort. P.P.S. If you prefer to make your gift by mail, send a check to the Center for Biological Diversity, PO Box 710, Tucson, AZ 85702 — or to give by phone, call toll-free 1-866-357-3349 x 316. Thank you for your support. Polar bear photo by Pete Spruance.
. When donating online to the Center for Biological Diversity, always confirm that the donation page is located at DemocracyinAction.org or BiologicalDiversity.org. Believe it or not, feeding squirrels is a fun and entertaining past-time for many who enjoy natures’ critters and backyard birding. As long as bird feeders are equipped with proper squirrel deterrents, everything’s usually good! Fun squirrel feeders range from munch box type, where the little guys must open the lid for the prize, to the big, glass jars they enter, and the kind made for corn cobs and squirrel logs – which are long-lasting compressed corn. 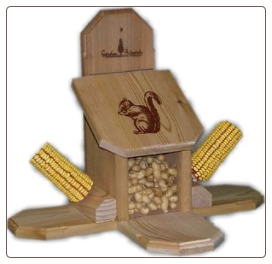 The Squngee Feeder is a hysterical bungee cord squirrel feeder made for using corn cobs or the logs. In frigid weather with snow and wind, we’ll smear gobs of peanut butter right on the cobs. Yes, peanut butter is a special and yummy treat for the furry critters. It provides extra energy to help them stay warm through its high fat and protein content. Any squirrel feeder accommodating corn cobs may be adapted this way. The giant tubs of peanut better are found at warehouse-type retailers like Sams or Costco and are relatively inexpensive when purchas ed in the industrial size. It can even be applied directly to tree bark, offering feathered friends a nutritious treat as well. Peanuts are also an excellent choice which may be purchased in bulk at most “feed & seed” stores. Squirrels love them, and again, they offer an excellent source of energy to help furry friends stay warm. If you know what and where to get bulk ingredients like these for your squirrel feeders, you’ll have fat and happy squirrels all winter long without breaking the bank! It’s been a wild ride, and the holiday sales have been good. 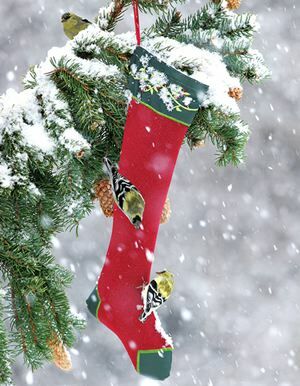 It’s wonderful to know that so many wild birds and squirrels will actually be having a very Merry Christmas too! Lots of birdhouses were packed, along with cool peanut feeders and many a finch bird feeder too. Many gifts were wrapped (free of charge) and personal attention went along with every order in the form of a hand written note, and expedited service. There’s something to be said about patronizing smaller businesses…it’s become a thing of the past, a forgotten art, if you will. “Hi Beth, What wonderful customer service. You reminded me why it’s so important to shop with small, personal businesses. I’m sure Patti will love her gift (we couldn’t stop laughing when we saw it online). Thank you so much for wrapping it. Have a wonderful, blessed Christmas season. Yes, it’s been a good season, and we truly appreciate all of our customers, old and new. We’d like to wish you and yours a wonderful holiday season, a very Merry Christmas and a Happy & Healthy New Year! So you don’t believe in global warming? Warning: This video includes disturbing footage of a malnourished polar bear mother and her two cubs in western Hudson Bay, Canada. Some may choose not to watch, because it includes graphic scenes of a malnourished cub experiencing seizures. Both cubs died within two days of the November 23, 2010, filming. As difficult as the images are to watch, they show the real-life struggle polar bears face each day trying to survive on a warming planet. Malnourishment, starvation and even cannibalism have become facts of life for polar bears in western Hudson Bay and other areas. A Warming Climate Takes its Toll on the Polar Bears of Hudson Bay. from Daniel J. Cox on Vimeo. 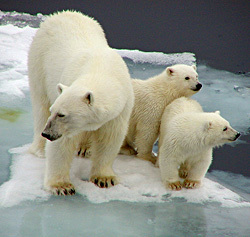 Polar bears are completely dependent upon large expanses of sea ice to hunt, feed and survive. They use the sea ice as a platform to capture seals and other prey. Global warming is rapidly melting their ice and lengthening the ice-free season, forcing bears to spend ever-longer periods of time on land, where there is little for them to eat. The longer bears like the ones in this video are stranded on land, the more likely they are to starve. Polar bears were listed as a threatened species under the U.S. Endangered Species Act in 2008 due to sea-ice declines and dwindling populations. The U.S. population is projected to go extinct by 2050 if climate change in not reined in soon; the entire species may disappear by the end of the century. The polar bears of western Hudson Bay are on the front line of global warming impacts: their population declined by 22 percent between 1987 and 2004 and may be the first driven extinct by climate change. The Center for Biological Diversity wrote the 2005 scientific petition to protect the polar bear under the Endangered Species Act. We later filed suit to ensure the listing occurred and to win 187,000 square miles of protected “critical habitat” in Alaska in December 2010. The Center is currently in court to upgrade the polar bear’s status from “threatened” to “endangered” and to ensure that greenhouse gas emissions in the lower 48 states, which are contributing to the melting of Arctic sea ice, are subject to Endangered Species Act regulation. I buried your cat today. No, I didn’t find her dead at the side of the road, although that is the final sad (and unnecessary) fate of far too many animals in White County. This was the cat that you put in a laundry basket with her four kittens and dumped in the woods outside Helen. I doubt that you could have been any crueler. You left a nursing cat and her six-week-old kittens without food or shelter in a harsh, unforgiving environment where their only options were starving to death, freezing to death, drowning, being terrorized and killed by roaming dogs or wild predators, or finding their way to a busy highway where they could become road kill. There simply is no excuse for what you did. Whether financial hardships or divorce or family illness or forced relocation or some other extenuating circumstance prompted you to do this, abandoning helpless animals is never the right solution. This story doesn’t end with your intentional mistreatment of this cat and her babies. A kind and caring person found the “garbage” you’d tossed in the woods and brought them to the Charles Smithgall Humane Society. Even though the shelter was stuffed to the point of bursting, they took in your throw-away cat and her kittens. The staff and volunteers at the shelter did their best for all of them, but it was obvious that the mother cat was not doing well. A simple blood test revealed that she had the feline leukemia virus, an insidious illness that severely cripples the cat’s immune system — and one that is almost always transmitted to kittens through the mother’s milk. Yes, all four of her kittens also have feline leukemia. There is no treatment or cure. Because you failed to have your cat tested for this virus and to have her spayed, it is a virtual certainty that every kitten she bore is infected with feline leukemia. Given her age, it is not likely that this was her first litter. Bad enough that you chose to cast these five specific animals aside like rubbish, but your irresponsibility has guaranteed that many, many more cats in this vicinity are carriers of this incurable feline disease. When their leukemia positive status became known, I brought all five of the cats to my house. The mother had one last night in a warm, safe, quiet home. She was too weak to walk, too weak to eat, too weak to even make a sound. This morning, I took her to my vet’s office where she was compassionately, humanely euthanized. She slept away peacefully in my arms. Your piece of trash became my beloved pet, even if only for a few hours, and I wept bitter tears for the horrors she was forced to bear because of your thoughtlessness. Then I wept again with tears of joy as I witnessed a sweet, sentient creature transformed from a pain-riddled relic of her former self (she weighed under five pounds — less than half of what the vet estimated her healthy body weight should be) into a blissful angel, released from suffering and free from the hell on earth you forced her to endure. I brought her body home from the vet’s office and dug a grave for her near those of my other pets. As I tossed each shovelful of dirt in the hole, I made a conscious effort to bury my anger towards you. It’s certainly too late for that anger to do any good for her, and I know it is only a corrosive acid that would eat away at me if I chose to hold on to it. So, I forgive you. Not because you deserve forgiveness for the unconscionable thing you did, but because I’d rather use my energies for good and positive things. You see, I have these four kittens who need someone to love them and play with them and take care of them, and their time on earth is likely to be quite short. I just wanted you to know I buried your cat today. So the mad holiday rush is on! I refer to this time frame as the “holidaze”, because folks seem to run around and rush in a dazed matter with concern about everyone on their gift list. It seems as though most are wearing blinders, and regardless of anything, just go! The big-ticket items are usually pretty simple, cut and dry so to speak. It’s usually just a matter of price comparison. The smaller, incidental gifts for friends, neighbors, teachers, and the like, can be tricky sometimes… especially if you’re stumped for an idea of what they might not only like – but really use and even enjoy. Imagine that? Holiday Thistle Feeders are the perfect gift for any nature-lover or birding enthusiast. Bet you never even thought of anything like a gift of nature? It’s the perfect choice because it actually gets used, is a long-lasting gift, and is enjoyed by both the recipient and the birds. Feeding thistle seed year-round will have Goldfinches’ electric yellow plumage gracing the yard in spring and summer months. Sweet calls and dispositions make these birds a welcome visitor to any yard, Also known as nyjer, this tiny, black, grain-like seed is a non-germinating one, so there’s never any weeds sprouting up below a thistle feeder. Simplify your holiday list with wonderful gifts of nature. Thistle feeders are an awesome gift idea and range from inexpensive stockings like this one, to large capacity tube-type feeders. Happy Birding and Happy Holidays!